your dishwashers won’t hate you. I guess it’s called taking responsibility for your actions. Or How Not to Make Enemies. Needless to say, today’s broccoli soup was not so beautiful. And listen, you WILL burn a pot (or two) in your lifetime. Doesn’t matter who you are. But when you DO have an impromptu barbeque at the bottom of your cooked creation.. here’s another tip: BAKING SODA. Baking Soda is very scienceful, and science = magic. Science and music. I call music magic too. Both = Incredible. Point is, if you soak the bottom of any charred pot with an inch of water and a liberal dose of baking soda (think: pasty bottom) and let it sit a few hours, the Black Awful comes off a lot faster. Overnight works wonders. You’ll still need some elbow grease, and probably steel wool, but when it doubt throw some soda on and let it brew a few hours. Then maybe a few hours more. This is one case where putting off till tomorrow what you could do today is an entirely acceptable motto. And then knuckle down and scrub like no tomorrow. Also, when the kitchen is 900 degrees and you’ve actually grown accustomed to feeling like a peach in a broiler, it’s okay to take your scrubbing party to the back deck. 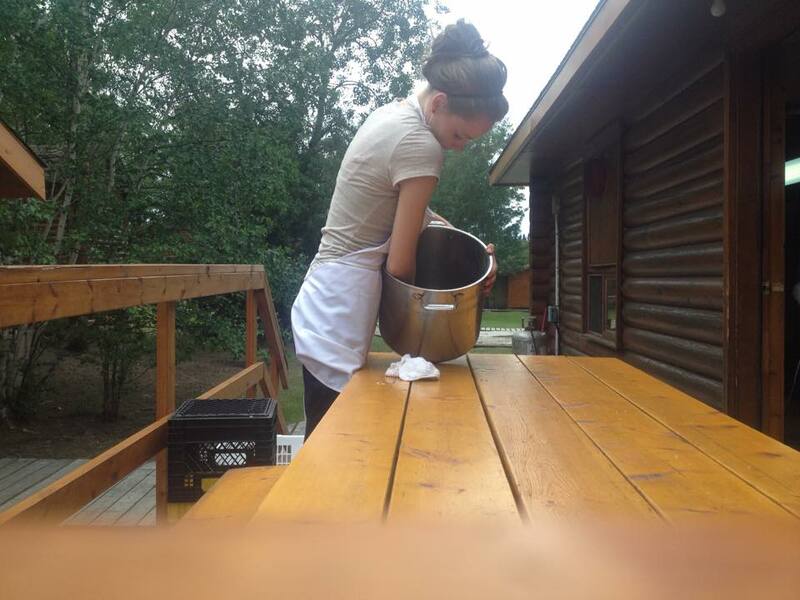 Plus, it doesn’t look as weird when you take an self-timed action shot selfie of you scrubbing a pot. I mean, not that you would do that. That’s weird…who does that? Um, yeah. It’s cooler outside. So scrub outside! That is all. just don’t burn your pot. Previous Post Throw-Back Thursday or Fish Lake Friday? sometimes after soaking the pot sdd more water to the baking soda paste and bring to boil the boiling action seems to lift it off as well. Saved a pot that I totally burned milk to a black thickness of about 1/4″ that way. Stunk bad but the pot came clean! and yes I have burnt many a pot in my lifetime and it is way better to do it yourself than pass on to dishwashers! Makes you think twice before leaving a pot to boil, just saying! That’s smart, Edith. I should have done that instead of let it sit the last few hours!